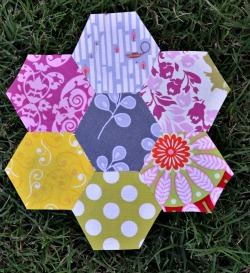 In June, in my Traveling Circles Bee, our hostess wanted very scrappy hexagons, measuring 1.25" for each side. This is what went in the mail to her. 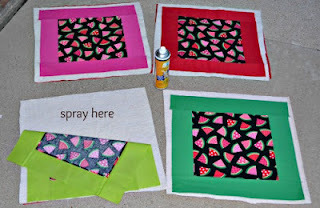 While sewing these, I have learned to use extra thread. I can't count the number of times the thread came through the eye of the needle on me as I was pulling it through. Great lesson. If you are curious about the other blocks that have been made for this bee, check them out! Greetings and welcome to any first time visitors who are stopping by to get acquainted! When Beth of Plum and June asked me to join her Let's Get Acquainted blog hop, it took me about a blink of the eye to reply back with a yes! Joining me today on the blog hop is the fabulous Lori from Adventures in Fabric. We hosted the Modern She Made Swap together and had a blast!! If you are interested in joining us for the next round, check back this fall! 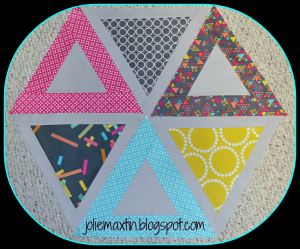 Join me as I show you how to make this quick and easy placemat here! And on a more personal note, I have answered some questions so that you can get to know me a little better, since the goal is to "get acquainted!" Q: How long have you been quilting? 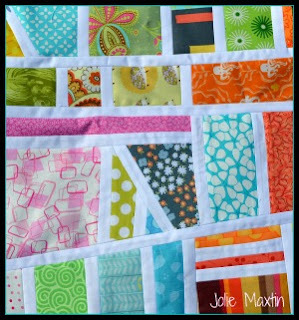 Q: Do you have any favorite quilting tips? Q: Do you have any favorite blogging tips? A: Try to include a link to a past post in every new post. Q: What is your favorite fabric? A: I have so many. 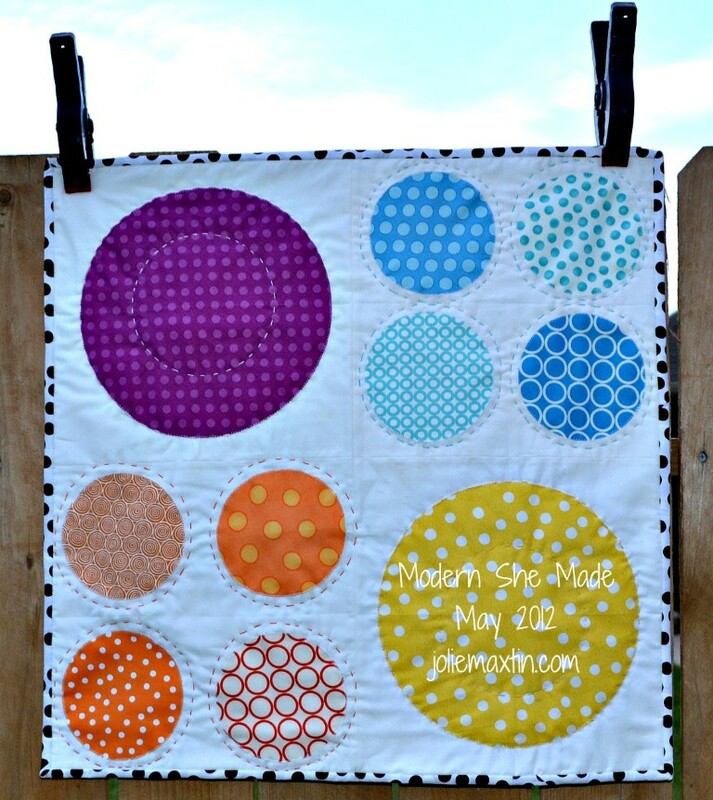 I love Kona Solids, Pezzy Print, Lizzy House Pearl Bracelets, and Metro Living Circles. Q: What is your favorite craft book? 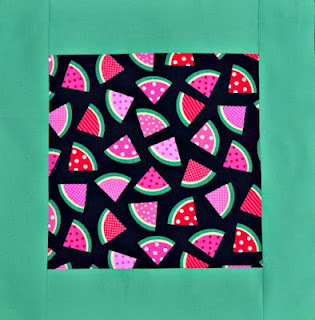 A: I refer to The Practical Guide to Patchwork by Elizabeth Hartman the most. Q: What is your favorite children's book? A: My 60mm Olfa rotary cutter. It cuts so smooth and I can't imagine cutting fabric without it. 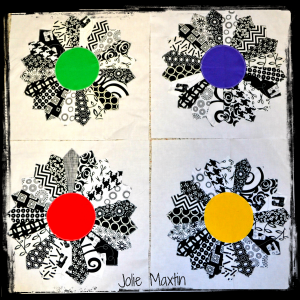 Q: What is your favorite music to listen to while quilting? A: That answer really depends on what day you ask me. I am a fan of Luke Bryan, Nickelback, Jason Aldean, 80's, Hip-Hop, R&B and Talk Radio. I do have a television in my sewing room and it is quite comfortable with any channel that is playing Law and Order. 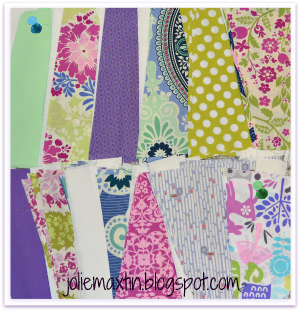 Q: What is your favorite TV to watch while hand stitching? A: I really enjoy The Good Wife, Celebrity Apprentice, 20/20, What Would You Do?, Shark Tank and The Big Bang Theory. Q: What are your thoughts on binding? Hand or Machine? A: I was taught to do hand binding and I enjoy the handiwork and the finished product. Lately though I have seen some really nice machine bindings and some even use zig zag stitches. 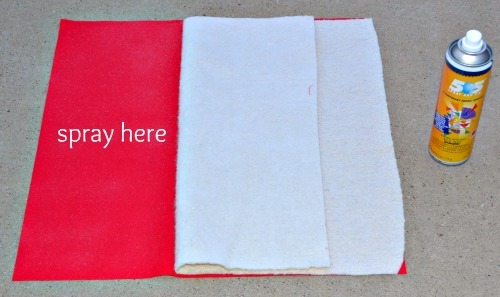 Hand stitching is where I am most comfortable, but I don't frown upon machine binding. As a matter of fact, this placemat is the first time I have done it. Thank you bunches for reading this rather lengthy post and I appreciate you stopping by. If you are looking for more inspiration and would like to visit some new blogs, Beth has quite a treat in store for you! Click on over! Plus earlier this week Svetlana and Beth had some great posts! If you wouldn't mind, please tell me in the comments what you like about my blog, don't like and any constructive criticisms - after all, you can't change if you don't know! 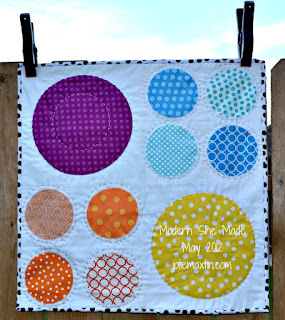 There is some great advice for anyone with a blog and a giveaway too! 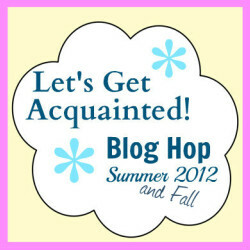 And while you are over there, check out some of the excellent posts in the Let's Get Acquainted Blog Hop. I'm up next week - yeah! 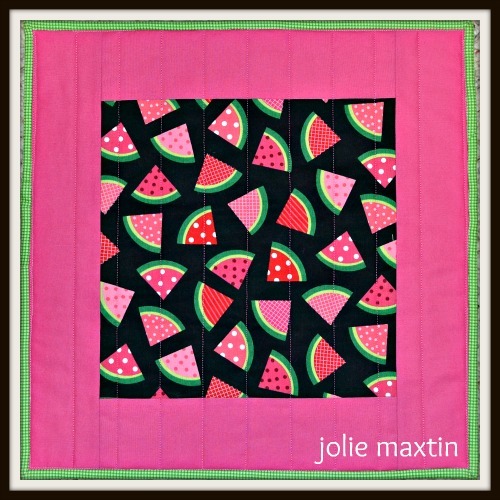 Have you seen the wonderful quilt using the New Wave pattern featured at ohfransson.com? So many people have made this quilt and although the pattern is the same, each one is so different. I love that! 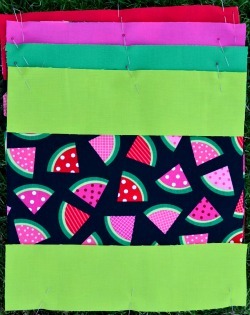 So much so that the next time I see a quilt-a-long, I will join! 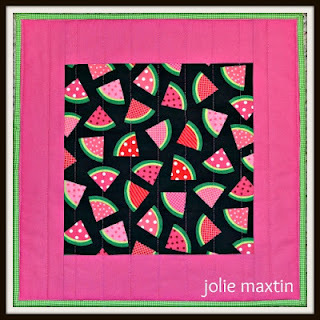 It is so neat for me to see the same pattern made in different fabrics. I digress. So...I had purchased a fat quarter pack some time back and I don't love it, but it had purple and pink in it, which is no doubt the reason I hit "buy" so...I decided to use it up! This is what I have so far. I am feeling like the green solid in the top left (blue push pin) sticks out like a sore thumb and while I am not so sure, what about that owly (is that a word) print (green push pin) in the bottom right? Does it go? It's kind of childish so I was thinking I would put it at the bottom where most of it gets cut off. Tell me, if I remove those two fabrics - what should I replace it with? Be honest - I can take it! 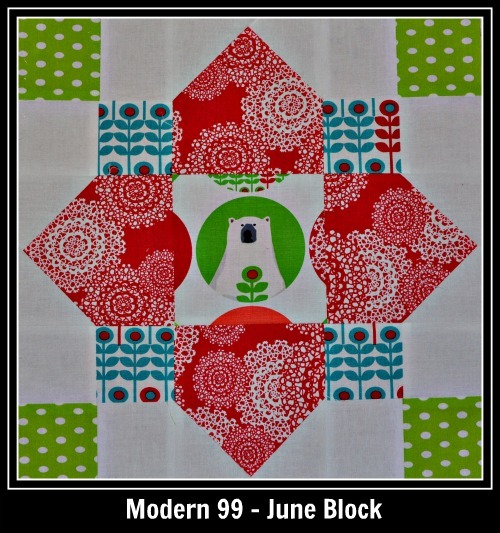 The first round of the Modern She Made Swap is wrapping up and it has been a delight! Lori from Adventures in Fabric and I embarked on our first group Flickr swap earlier this year and we have so many talented gals in our group! 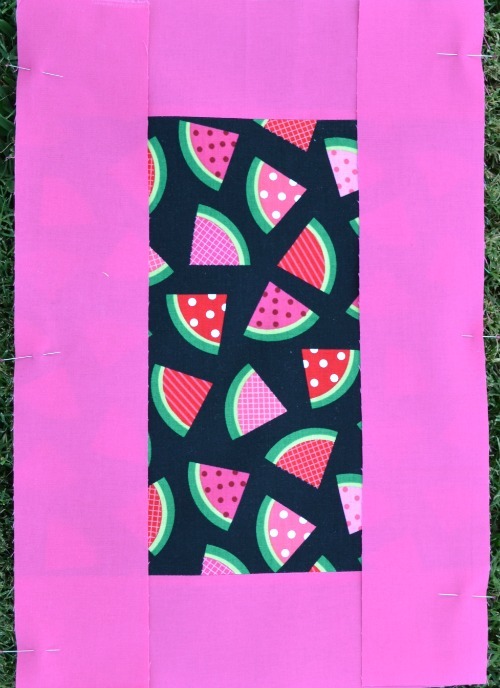 In fact, if you would like to take a peek at the finished products, head on over, but make sure you have some time, you just might get wrapped up in all the goodness! 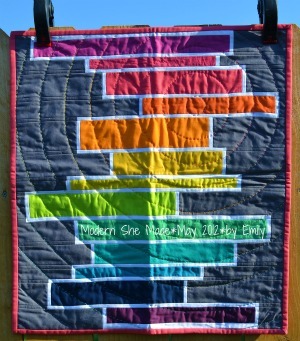 The mini-quilt above was made for my partner, Nicole of Mama Love Quilts. The theme for this round was that our finished product must have a circle incorporated in some manner. 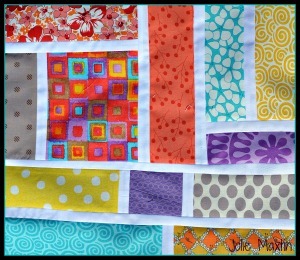 The lovely Emily of Hunky Dory Ok made this stunning mini quilt for me, along with a great zip pouch of goodies too! 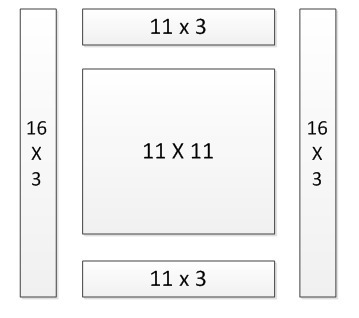 One of the greatest components of these swaps is that you fill out a series of questions so your partner makes something tailored just for you. I love love love this. Thank you bunches Miss Emily! Here are my Mod Mosaic blocks for June. My hostess said she likes bright colors, use up the scraps and bright white sashing, so...this is what she gets! 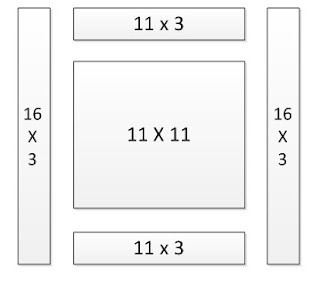 I have found these blocks to take me a while, which is a surprise since I have been doing them for 6 months now. I need to start thinking about what I want my theme to be, as my turn will be here before I know it.